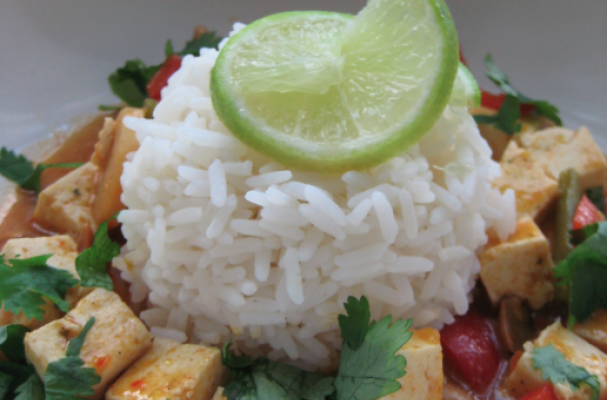 Thai tofu red curry is a vegetarian meal packed with flavor. Vegetarian food is sometimes regarded as bland but this one hits on all the notes - sweet, sour, bitter, spicy and umami (savory). Crispy baked tofu is tossed in a flavorful homemade red curry sauce studded with red peppers and carrots. When vegetarian meals taste this good, you won't even miss the meat. Cook rice according to package directions using a rice cooker or the stove top method. Drain the liquid from the tofu and place the cube on a plate lined with paper towels. Place another paper towel and plate on top of the tofu block and put a heavy can or book over the top of the top plate to remove the excess moisture from the tofu to drain. After 5 minutes remove the tofu from the paper towels and slice into small cubes. Place the cubes in a zip lock bag with 2 teaspoons of corn starch and shake to coat. Bake the tofu for 15-20 minutes. Meanwhile, heat a large skillet over medium heat and toast the curry paste until fragrant, about 1 to 2 minutes. Add the vegetable oil along with the red pepper, carrot, and garlic to the pan. Cook for 3 to 5 minutes until the red pepper has begun to soften. Add the coconut milk, sesame oil, fish sauce, sugar and red pepper flakes. Stir to combine until all the ingredients are well incorporated. Allow the curry sauce to cook for 15 to 20 minutes until the vegetables are soft. Add the cubed tofu and mix until the tofu is completely coated by the sauce. Garnish with chopped cilantro and a lime wedge. Serve hot with rice.